Spencers Solicitors | Which of these common driving habits is illegal? London's Cycle Hire scheme: Four years on, what's the verdict? Which of these common driving habits is illegal? Most of us are aware of the need to avoid distractions when driving, but many people still find it tempting to use their car journey as a time to grab something to eat or catch up on phone calls. You may be surprised by one survey from 2013 that found nearly 50% of women apply cosmetics when driving, which insurers estimate leads to 450,000 car crashes annually. Police have begun using more covert methods to catch increasingly bizarre acts from those behind the wheel. Through this, one police authority in Hampshire released a video of a lorry driver actually brushing his teeth behind the wheel! But which common distractions, while not actually illegal, are still pretty dangerous, and could result in a driving without due care and attention charge? Over the last year the law has changed, with police now holding the power to hand out fixed penalty notices for careless driving, and the level of penalty for most motoring offences now being set at £100. 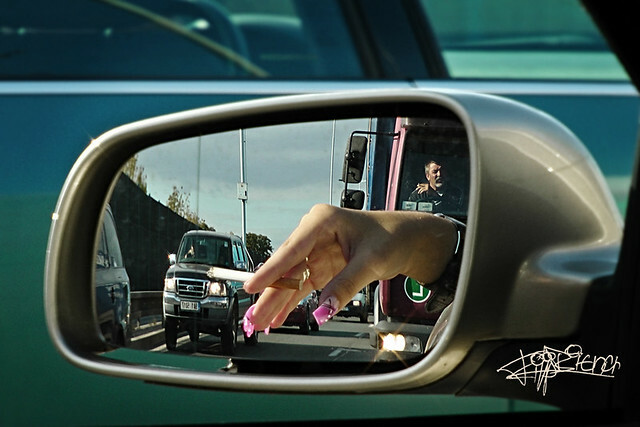 One of the key issues is that although most people are aware of the law against driving and mobile phone use, many drivers still find it impossible to avoid this distraction. Using your phone is only legal if you are safely parked or calling 999 in an emergency and unable to stop. In most cases, punishment is at least three penalty points and a £100 fine, but in serious cases it could mean a driving ban. Even if you were using hands-free, if police believe you were distracted while driving then you could still be penalised. It is now common knowledge that seat belts are a legal requirement, and most drivers are quite happy to conform to the seat belt rule. However, it may be surprising to some that failing to wear a seat belt is enforced by a fine of up to £500. Road safety charity Brake found that nearly a third (29%) of motorists have opened and consumed something behind the wheel. A similar number had something that was passed to them and opened by a passenger, while the majority (62%) had eaten while driving in the previous 12 months. And while footwear may seem irrelevant to some, last summer a survey by a major insurance company found that flip-flops are more hazardous to drive in than high heels. Yet a third of drivers admit wearing them, even though a tenth also admitted they'd had a near-miss while doing so. Most worryingly, the fact that they can slow braking times by 0.13 seconds means that at 60mph you'll travel more than three metres further. Even though many of these activities aren't actually illegal, the consequences can still be severe - both in terms of financial loss and the risk of serious injury on the road. To some people the thought of having penalty points slapped on their licence along with paying out a fine and increased insurance premium, is a sufficient deterrent. Sadly for others this is not, and so it is important they take time to consider the potential consequences and keep these habits out of the car - not only for their own safety, but for that of their passengers and other roads users. I feel the message is clear. If you're driving, don't use the time to do your make-up, have lunch or chat on the phone, and please wear a proper pair of shoes! What driving habits do you think are the most dangerous and should be made illegal? Let me know in the comments.